Join Heart of Missouri Court Appointed Special Advocates (CASA) in its first annual Voices of Columbia event! Voices of Columbia is a singing competition, with a twist. The title of “The Voice of Columbia” is awarded to the musician who brings in the most funds for local nonprofit, Heart of Missouri CASA! The night of the event, each of the eight talented bands/singers will perform two songs. After everyone has performed, guests can “vote” for their favorite performance. 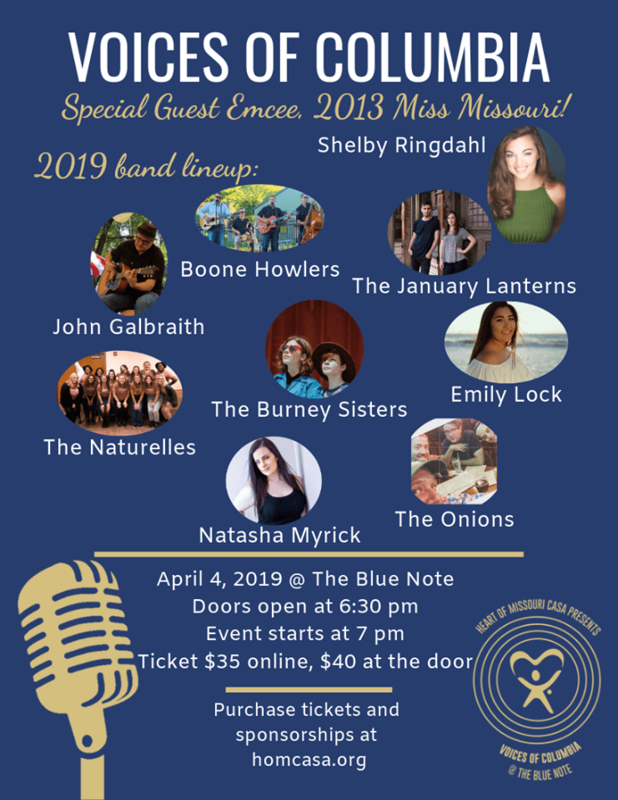 The event is named “Voices of Columbia” because at CASA, we serve as the ‘voices for children’ in foster care, and our musicians also become voices for foster children by giving their time and talent to raise funds!